The Colne Valley Water Company opened the Eastbury Pumping Station near Watford in 1873. In 1931/1932, the company opened a narrow gauge railway connecting the pumping station with the LNWR's standard gauge branch line that ran between Watford and Rickmansworth. The 2.0' narrow gauge line ran southeast from a private siding on the LNWR (the remains of which can still be seen) across the fields of Brightwell Farm, crossing the River Colne via a relatively substantial plate girder bridge. The line ended in a yard at the pumping station. Coal and salt were delivered by the LMS via its Watford to Rickmansworth branch line as far as the Brightwell Farm transfer sidings and transferred to the Water Company's own 2.0' gauge wagons, then hauled the short distance by one of two Ruston Hornsby twin cylinder 16hp diesel locomotives. The coal was to power the pumping station and salt and chlorine were used for the water softening plant. When the pumping station switched from coal to diesel power in 1956, the use of the railway declined significantly, though chlorine and salt were still carried by rail. The line closed in 1967 and the two locomotives (RH166015, 4wDM, 1932 and RH1662024, 4wDM, 1933) were purchased for preservation by the Amberley Chalk Pits Museum near Arundel in West Sussex. Very little is left to show where the railway ran across the fields. 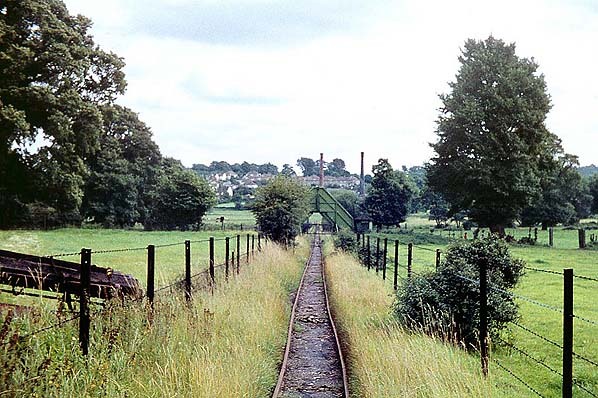 The place where the transfer sidings was can still be viewed from what is now the Ebury Way (previously the LNWR Watford to Rickmansworth branch line). On the public footpath that runs from Brightwell Farm to Hamper Mill, remains of the footings for the footbridge can still be seen, with original gates now part of the field fence. The track bed can be seen rising slightly towards the river to the southeast (Eastbury Road side), but the girder bridge is impassable and on private land. Colne Valley waterworks tramway in August 1960; the waterworks is seen in the background. The green painted triangular structure in the centre was a footbridge. Walkers using the public footpath to and from Hamper Mill used it to cross the railway. It came from the ‘Never Stop Railway’ at the Wembley Exhibition, 1925.